Some Instructors operate on a professional freelance or self-employed basis, and offer a wide range of caving activities. 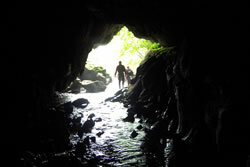 This can vary from single day introductory educational and adventure trips in a cave or abandoned mine suitable for beginners, (schools, families, Scouts, corporate teams, etc), through to one to one guiding over several days, or a programme of technical instruction in personal skills, rigging, and rescue delivered over a period of months. Whatever your interests or ability, ACI members will be able to tailor their instruction to meet your needs. Although often specialising in particular caving areas, most will work throughout the UK and abroad. Many are also qualified in other activities and are able to provide instruction in rock climbing, gorge scrambling, mountaineering, canoeing, orienteering etc. Those who work with the under 18's will be licensed by the Adventure Activities Licensing Authority, and all will carry professional liability insurance. Protective clothing and specialist equipment will often be provided or available for hire. In addition to instruction and guiding, ACI members are able to offer advice and guidance to organisations and clubs with regard to leadership, training and safety.